A skydiver is (obviously) someone who works with the sport of skydiving, whether as an instructor, a coach, a parachute packer or a photographer! Originally I was going to do this article only on the instructor position, but I decided that I wanted to feature a few other jobs for those who aren’t necessarily interested in making a full-blown career out of skydiving! There are other job opportunities available for skydiving-enthusiasts, that involve less licensing and less of a commitment. A skydiving instructor is that thrill-seeking, adrenaline junkie who jumps out of planes for a living…and teaches others to do the same! Their job is to take their students 2 and half miles into the sky, and free fall through the clouds at 100+ mph- sometimes up to 10-12 times per day! This job is actually not as reckless as the description makes it sounds; in fact, this role, as with all skydiving employee roles, is all about safety. Before all of the jumping and flying can happen, the skydiving instructor thoroughly educates their students on landing procedures, body positing and other safety instructions. Once proper training has been completed and the equipment has been checked on the ground, the instructor and the students will take-off into the clouds, and make the jump. Instructors may go with a student, in what is called a tandem jump- during which the instructor and student are attached and the instructor is in control of the jump; OR, the instructor may act as a supervisor to solo jumpers going for their skydiving license. A parachute packer is a skydiver who assists with packing the parachutes for instructors and students. Although this may not be the most thrilling job in the drop zone, it is a good way to network with other skydivers, and can get you quick cash for every parachute that you pack! The on-site photographers and footage editors will be the skydivers who are filming, photographing and editing the footage of the jumps! Usually, most skydiving schools offer their students the option of purchasing pictures and videos taken during the jump- therefore, there is placement for skydivers who don’t necessarily have enough licensing to become an instructor, but are able to solo jump and capture the footage for the other jumpers. If you have never been skydiving before- don’t be too quick to rule these options out. 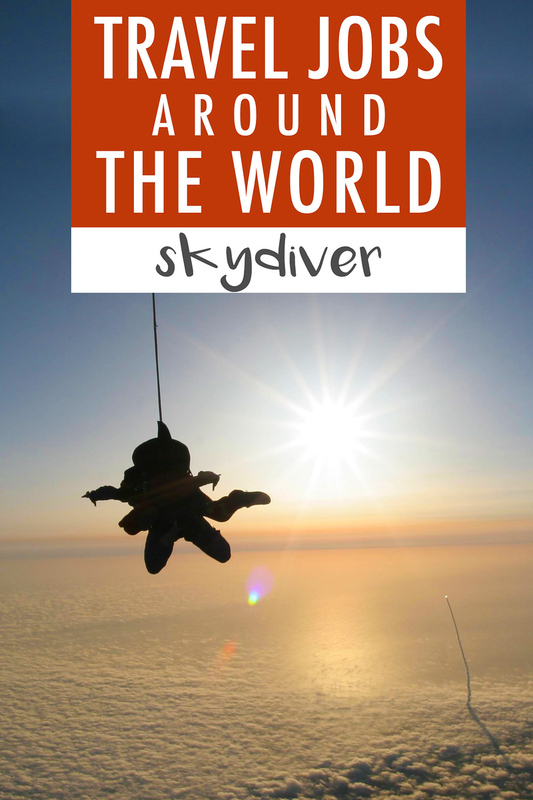 Some people try skydiving for the first time and absolutely fall in love with the sport! If you have always wondered what it would feel like to fly, to float in the clouds with beautiful 100-mile views in all directions- maybe you should give skydiving a shot. It may be the perfect travel job for you! This is definitely not your typical 9-5 job, but every day is new and exciting. You will be sharing a unique experience with strangers, which they will remember for the rest of their lives. It is a fulfilling and exhilarating day of work, every time! Skydiving is based on the weather, and so although positions can be found around the world, they may only exist during a particular season. Locations with mild weather year-round, such as California or other warm-weather places, may have a need for employees throughout the entire year. If you would like more specific information on where this job may exist, you can visit Dropzone, in order to get a map view of dropzones around the world. First, you will need to sign up for your first jump! You can google to find dropzones in your desired location, and book your jump. First, you will go over the safety procedures and receive your ground training, and then you will make a tandem jump with an instructor. Flying high through the sky! If you loved your first jump, you can continue in the licensing process by taking your AFF (Accelerated Free Fall) ground training, after which you will be able to make your first of many solo jumps! During the first 8 solo jumps, an instructor will accompany you- but after that, you will finally be cleared to jump with minimal supervision. Once you have reached 25 solo jumps, you will be ready to take an exam to go for your A License. With your A License, you will have proven yourself to be a serious skydiver, and recognized as being legitimately capable of helping out at the drop zones! If you would like to go further with your licensing, or would like to become an instructor, you will need to take more training courses and get much more experience in the air – at least 500 jumps under your belt and 3 hours of free fall time. Just to clarify, even if you don’t have your A License, you can still be trained to help out with parachute packing and video editing- jobs which don’t take place in the air! This may be a goo way to supplement the costs of your jumps or courses! After having experience with jumps or going through licensing, you will probably at this point already be pretty well networked, and can use that to your advantage. Ask your fellow skydiver friends for advice and contacts with finding a new job, join Facebook groups and become active with message boards on skydiving-related websites. If you are trying to pick up work while traveling, call ahead or stop by the nearest dropzone to see if you can spend the day assisting with rigging or packing parachutes. Instructors will probably be happy for the help, and you can earn $5 per rig and $10 per tandem! If you’d like to base around one location for a while during your travels, and you’re good with a camera, see if you can act as the GoPro handler or video editor! Your skills may be just what they are looking for, and you will have an opportunity to do some jumping, and make some money. Skydiving jobs are fairly flexible, so another option would be to offer to fill in for a full-time employee who may be looking for some time off. Win-win situation! Last but not least— a very important tip for getting a job: be likeable! Show that you are a cool person to help out around the dropzone. You are bound to mesh with the other skydivers, since you already share an extreme passion for the same sport… so just demonstrate that you are a qualified, hardworking and FUN individual! I would recommend using Dropzone and USPA if you are interested to learn more details with skydiving, to search for dropzone locations and/or to read through the user forums! As mentioned, in order to be a parachute packer or video you editor you don’t necessarily NEED your A license. You may just need training, the required skill-set for whichever job you’re going for, and hopefully a passion for skydiving! It is definitely preferred that you have your A License in order to demonstrate that you are qualified and up to date with the safety procedures, if you plan on doing any sort of job in the air. The more licenses you have, the better! As for becoming an instructor- you will need to go through extensive training, and have a minimum of 500 jumps and 3 hours of free fall logged. YIKES! But, the commitment will pay off if you end up doing something that you absolutely love every day! Availability is very dependent on the location and weather. Some locations will be closed during the cold months, and all trips will be off depending on the rain- there needs to be clear skies in order to make the jumps! Some jobs are individually contracted, so you could sign up to work in one location during the season, and line up other work afterwards. If you would like to help out at the dropzones as you travel, make sure that your job search is in line with the skydiving season of your location! Salaries for instructors can range from $25-$35 per jump, and at around 1000 jumps per year for a full-time instructor, earnings can be expected as about $30000 annually! I have enjoyed this website thus far, but as a licensed and accomplished skydiver I am very concerned about the inaccuracy of the information you are giving here. People with A licenses are not considered “legitimately capable of helping out at the drop zones.” The only thing they should be focusing on is gaining more experience as a skydiver, not imparting it to others. No reputable dropzone will allow a novice skydiver to assist with rigging–becoming a rigger requires a serious course of study and special licensing, and people’s lives would be in serious danger if these strict requirements were not followed. A novice skydiver can not work as a an in-flight video operator either–the ability to match one’s fall rate to a tandem or group of skydivers is an incredibly difficult skill, and you could easily injure other skydivers without significant experience. Skydiving is an amazing sport, but its dangers should not be taken lightly, and the industry’s jobs are not for the novice.